It doesn’t take a genius to figure out it’s extremely difficult to get anything accomplished in Washington these days. It wasn’t supposed to be this way, either. The Founding Fathers’ brilliant framework for representative government was designed to function simply and efficiently. Bills dealing with revenue matters would originate in the House where the representatives closest to the People would have fair debate and then cast votes to pass or decline the measure. If the bill advanced it would then move to the Senate where the individual states’ representatives (known as senators) would follow a similar procedure to the House. With only two senators from each state, no single state or region could dominate. Therefore, some semblance of national “consensus” would rule the day. Lastly, if the bill passed through the House and Senate it would go to the president’s desk for a signature or a veto. Should the bill be rejected by the president it could still become law through both houses of Congress voting with two-thirds majorities to pass the proposition. Therefore, everyone technically has “skin in the game.” The people, states and executive all have a say and none of them can gain a tyrannical upper-hand (we won’t address the Supreme Court here) over the others. It would take weeks to try and explain how the Founders’ original vision got so far off track, but it’s safe to say in 2017 it’s much more challenging to get anything through Congress. Party politics, the passage of time and growth in the stature of the United States has complicated the process considerably. The tax code alone has well over 70,000 pages. Just locating and defining a tax provision is a major undertaking. We’ve reached the point where there’s virtual gridlock in Congress simply because there are so many competing interests and views on issues that it’s excruciating to even get something started, much less passed. And then there’s the congressional leadership to deal with. This is where someone like Vice President Mike Pence might be able to help unclog the jam. That’s the key to Pence’s success -- he’s got credibility with virtually every Republican group. Pence has establishment support because he served in the House for over a decade, knows the current party leadership well and works alongside people like Trump chief of staff Reince Priebus to represent the administration’s views. At the same time, Pence has earned the trust of movement conservatives by demonstrating over the course of his political career that his principles and views are real and he’s capable of resisting the pressure of the party leadership to say “no” when it counts. 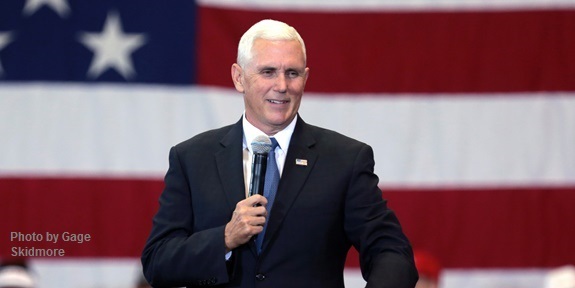 Last but not least, Pence enjoys grassroots backing because he represents the popularity of the president and has fought the good fight on a number of vital fiscal and social issues in Washington and in Indiana. Plus, he’s not personally wealthy (so no conflicts of interest there), has a homespun likeable personality and embodies all of the behavioral attributes Trump may lack. Look at it this way -- when Donald Trump walks into a room people take notice. Those who appreciate Trump’s rough edges and straightforward in-your-face directness understand where he’s coming from. Those who don’t like Trump see him as brash, rude and dismissive… not fit for the office of the presidency. This is where “temperament” comes in. Pence, on the other hand, has a calming effect when he’s around. The man doesn’t look like he’s ever gotten mad and probably wouldn’t yell even if he were on fire. Pence was ridiculed by liberals several weeks ago for saying he wouldn’t dine alone with a woman who isn’t his wife, but the episode provided a good example of why Pence has a soothing influence on people. Pence’s faith is genuine and he practices what he preaches. If he says something, he means it. A good number of conservatives aren’t as comfortable granting Pence (or anyone) that much leeway, but Grover’s trust is representative of the warm feelings Republicans and conservatives have for the vice president. Pence will need that degree of confidence and flexibility in the upcoming negotiations with Congress because there’s already concern Trump’s tax proposals won’t be detailed enough. David M. Drucker of the Washington Examiner writes, “The president campaigned on a fundamental overhaul of the federal tax code compatible with a plan drafted by House Speaker Paul Ryan, R-Wis., His would generate $1 trillion in revenue by radically transforming how imports and exports are levied. “But Trump backed away from the proposal soon after winning the election and has since been vague about his position on tax reform beyond platitudes about wanting to simplify the code and cut corporate and individual rates. From what Drucker’s article makes it sound like lobbyists are fraught with worry that their industry’s special perks may not be specifically addressed by Trump’s tax proposals. At the same time, conservatives are concerned the plan won’t include a full-scale overhaul of the tax code, instead offering only rate cuts. All agree the issue is extremely complex. That’s what happens when special interests have been carving out exceptions and additions for decades and the tax code swells to lengths that not even the savviest and smartest of tax experts can ingest and comprehend in total. Perhaps Vice President Pence’s leadership can resolve the differences, or maybe the Republicans will just bicker away another opportunity to solve a legislative problem. They’ll all look bad in the process. One thing’s for sure: it ain’t how the Founding Fathers drew it up. As I’ve pointed out a lot recently, it’s liberal Fox News personality Juan Williams’ job to be unreasonable. In the marketplace of ideas, even a conservative-leaning media outlet like Fox needs someone like Williams’ ideas to contrast the more legitimate views offered by the network’s conservative guests. But what Williams wrote this week about President Donald Trump’s first 100 days is absurd even by his low-bar standards. Williams wrote at The Hill on Monday, “Even Trump’s supporters have to admit these first three months have been defined by the administration’s failure to deliver on campaign promises. In his piece Williams also hits Trump over the lack of progress on a border wall or an indication that Mexico will pay for it. The liberal commentator’s only conceded Trump success was the nomination and confirmation of Justice Neil Gorsuch. Juan concluded his op-ed by offering his standard prediction that Trump’s “broken promises” and general unpopularity will sink the GOP in next year’s midterm elections. While I was sorely tempted to make another “who cares what Juan Williams thinks” argument here, the thought occurred to me that Democrats are just trying to advance the argument that Trump will have the same disastrous effect on the GOP as Obama had on the Democrats. By consistently pointing to polls showing Trump as unpopular and as a potential drag on Republican congressional candidates, Democrats are hoping against hope that people abandon the new president before he’s really had much of a chance to do anything meaningful in the legislative arena. First, Trump is not Obama and Trump’s voters are not knee-jerk rubber-stamp followers (like Obama’s) who aren’t able to distinguish the president from Congress. Obama managed to win two national elections due in part to his cult-of-personality but also because the GOP only offered warmed-over establishment Bush-ism to compete against him. Voters didn’t want more of the establishment status quo so they turned out for Barack but roundly rejected other Democrats who didn’t present any reason to vote for them. If you don’t believe it, check out the disparity in the numbers in Congress and at the state level before and after Obama. It’s an astonishing difference. Thank you Barry O! Second, the positive benefits from Trump’s executive actions from the first 100 days will not become evident until the economy numbers improve, more people are back to work productively and other indicators, such as illegal immigration reduction figures, are introduced to demonstrate good things are happening despite the malaise in Congress. Three, the first several times Justice Neil Gorsuch and his constitutional originalist philosophy provides the difference in 5-4 Supreme Court decisions will only highlight just how valuable it was to have President Donald Trump in the White House. Having Gorsuch on the Court is like an ongoing public relations campaign and will save the country from the hated political correctness that’s killing it. Every time Gorsuch does something right, people will hear about it…and Trump will get the credit. Lastly, time will tell if the Republicans can get together to pass some major bills that will make a real difference in people’s lives. If they do, Democrats will claim “it only benefitted the rich” but Americans know better. The so-called “failures” of the first 100-days will long be forgotten. The here and now always wins in politics…and that must have Democrats like Juan Williams terrified at the prospect. The other day The Hill (Rebecca Savransky) reported on a poll showing only 2 percent of those who voted for Donald Trump expressed regret about doing so, meaning that Trump’s voting coalition is still very much intact. And despite what people like Juan Williams might argue, the antics of the left aren’t winning them any converts. In fact, there’s evidence some may be gravitating towards Trump. Even former Hillary supporters are starting to see the bright side of having Trump as president. Lisa Belkin of Yahoo News reports, “A lot has been written since Election Day about people who didn’t vote at all and wish they had because they were unhappy with the results. And a lot more has been written about those who cast their vote for the winner and came to regret it…And there is talk of hushed Trump support, people who voted for him but don’t admit that to pollsters or their social circles. “But what of those who might be called ‘Donny-Come-Latelys’? People who did not support the candidate on Nov. 8, but now, 100 days in, find that they do? Aside from the obvious “you can’t be serious” liberal tone so prevalent in all of Yahoo News, Belkin’s article was actually enlightening. Of particular interest was a quote from an Obama supporting small business owner from California (David Kord Murray) who now wishes he would have voted for Trump because the regulatory state has gotten out of control and Trump is actually doing something about it. I’m sure Kord Murray’s views are common in the business community. There will be more where he came from. Going back to reason number two in the previous section (how people will begin to see positive benefits), it will take time for the Trump administration’s regulatory reform actions to take effect – but when they do, there will be lots of people who see them. Their sentiments will be similar to Kord Murray’s and Trump’s approval numbers will rise, regardless of what Congress does or doesn’t do. Donald Trump’s presidency is a complexity that will take a long time to figure out. But over the course of months and years, the benefits will eventually rise to the surface. People will see America getting “great again” and will call for more. Take that, Juan Williams.